Use it Up, Wear it Out... - A Rose Is A Rose Is A Rose! This picture reminds me of the mantra ‘Reduce, Reuse and Recycle’, which we need to make it as a way of life. This not only helps in reducing waste and conserving resources but protects our environment too. Here are a few things that I do reflect the philosophy of Use it Up, Wear it Out, Make it Do, or Do Without. I prefer to use both sides of the paper while printing. 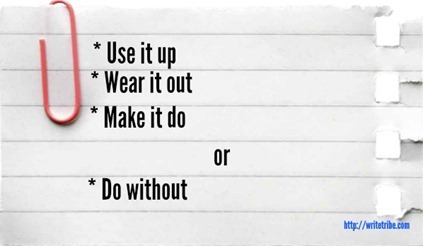 If the above cannot be done, then, I tear a few single side printed papers into two and staple them together to make a small note pad and use it for making lists, or writing down important points when on a call. I hate wasting food. So, all the leftovers are turned into something new and interesting. The leftover cooked rice is used to make rice pancakes or KG’s favourite signature dish, Tahiri. 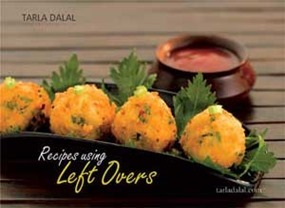 I have a cook book from Tarla Dalal which is titled, “Recipes using Left Overs”. Can you believe that? We have a lady who has a small boutique near our home and she specializes in making bags out of old jeans, beautiful patchwork bedcovers from old clothes, light quilts from old sarees. So, I use her skills and use the old clothes in the house in a new avataar. Kids outgrow their clothes so fast and I do that too, due to ever changing increasing waistline. So, all our clothes which are in good condition are donated at SOS Village or Mother Teresa Home or given to the house helps. Old but good bed sheets are folded and cut into small sizes and made as door mats. 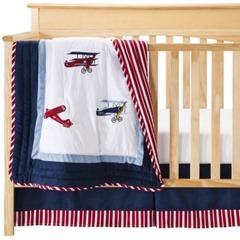 I remember my Mom made a lot of baby crib sheets and bedding from old bed sheets when Aaryan was born. Not buying things just because they are on SALE which actually I don’t really need and didn’t really want before I saw them on sale. I certainly do not waste my money on such ‘attractions’ now. We learnt the hard way that Credit Cards are like loan sharks. Using a Debit Card instead of a Credit Card works for us and that we have not used a Credit Card since the last 10 years makes us feel very proud and stress free. Adopting the philosophy of Use it Up, Wear it Out, Make it Do, or Do Without in ever day life is not about being miser or a penny-pincher. It is about making the best use of the given resources, it is about choosing to opt for a frugal living. Do you believe in philosophy of Use it Up, Wear it Out, Make it Do, or Do Without in your life? If yes, please do share about your frugal choices in life! This is actually in line with one of my New Year’s resolutions: to reduce my spending. I have a problem. It’s called mid century modern (all things from the 1950’s-1970’s.) I have been buying this stuff like a drunk on a binge for the past two years, and no longer have the room or the budget to support my habit any longer, so I stopped, sort of. Today, I bought 2 lamps in this style, but they were cheap and we needed them so I found a way to justify the slip. I am very frugal when it comes to clothing, dish washing liquid, appliances, etc. I will use something until it breaks or splits or runs out. I don’t have 200 purses. I use one until it bursts a seam or something. I hate gaining weight because it means I have to buy new clothes, but it seems to be an unavoidable consequence of aging. I buy used when I can. I keep old filled notebooks, using the backs of page/half filled pages for grocery lists, etc. I have reusable grocery bags instead of using the plastic ones. I try to buy one big carton of some snack my kids like instead of the prepackaged smaller versions to avoid all that packaging. That’s about all I can think of, but I definitely follow this way of living. The biggest problem I face is the disposal of e-waste. Old cell phones, laptops, music systems, etc. are all stacked in the loft because I don’t want to dump them in the dump yard. I guess I’ll have to search for an e-waste recycler and give it all to them. Great tips! I have made door mats with old dupattas. I am told there are notebooks available without the usual margins (on the left and top) to avoid wasting space. Excellent post! Wow! Dupatta door mats are cool too. And notebooks without margins is a saver too! Thanks Archana. Glad you liked it! Very practical tips. Here too a lady makes quilts and bags from old sari’s and jeans. I only disagree about the credit cards – if you make sure you pay the whole amount on time – then you get a 45 day interest free credit – the trick is understand the cycle and make purchases at the right time. Thanks Corinne. True, we need to recycle things more than ever before. Loved this post. 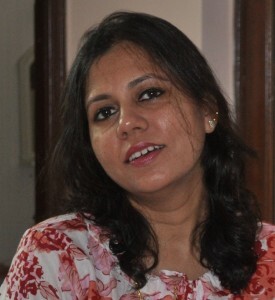 shilpa:) Amazed at the way you correlated the WT prompt into such a beautiful and useful post. Totally Agree with what you say and do most of what you do. Even the kitchen wastes like peels and hulled veggie wastes, i put them in a compost pit. I collect the biscuit wrappes, chocolate wrappers and give it to ITC who have a plant where they recycle and convert it into packing or other useful material. The old clothes of children go to the younger cousins in the family or to the maids children. My mom and MIL both stitch, so many torn bedsheets or durable clothes end up as patchwork quilts or pillow covers or bags. the jeans end up as capris or bermuda shorts. and many more…. Maybe i will write a post. yes, it is not about being miserly or penny pinching, it is about sensible and economic living in the best interests of a sustainable world. I am now waiting to read your post on this and looking forward to learn more from your experience, Asha! Pls do share a post on this need of the hour subject, soon! Lovely! Lol must get my hands on that book of yours! SOunds pretty interesting! And way to go about the credit cards thing…I know quite a few people who have been drowning in debt simply because they have been using the credit card! I have stuck to a debt card myself! This is a way of life in our neck of the woods, as much out of necessity as anything else. Consider a gallon jug of milk. When it is empty, we use it for making sweet tea. When the repeated heating and cooling starts to wear on the plastic, we cut it apart to use as a funnel/scoop and a plant starter. Provided the dogs don’t get to them, we use them repeatedly until they tear or disintegrate. Some very good ideas there, Shilpa! And very nice take on the prompt. I have been keeping some old saris that I need to get converted into some quilts and other things for the home. I try to reuse things whenever possible. And I try to stay mindful when buying too…but sometimes stuff does get accumulated so it is important to recycle and give away what we don’t need or use. By the way, I use the back side of the printed receipts from stores to write my lists for grocery shopping etc, I find that just so handy! You gave some good advice there Shilpa. These are such age old things that have been impressed upon us by our parents. I think they were way more frugal than we will ever be. Shilpa,while reading this and ref to Tarla Dalal takes me back a few years. I had initiated and shot a one hour Video “Whats Cooking”with Tarala Dalal. Due to some problem in my WordPress Reader, I did not get your posts from K onwards. I assumed you had stopped at J for some unavoidable reason. I saw your comment on another blog and came here to check. Excellent tips in this post! I follow quite a few of them. Celebrities have a role to play in proper use of clothes as well. Princess Kate has been in the news a number of times for repeating the same dress in public. She may be scandalizing the fashionistas, but she’s doing the world a good turn.